The concept of similarity is used as the basis for many data exploration and data mining tasks. Nearest neighbor (NN) queries identify the most similar items, or in terms of distance the closest points to a query point. Similarity is traditionally characterized using a distance function between multi-dimensional feature vectors. However, when the data is high-dimensional, traditional distance functions fail to significantly distinguish between the closest and furthest points, as few dissimilar dimensions dominate the distance function. Localized similarity functions, i.e. functions that only consider dimensions close to the query, quantize each dimension independently and only compute similarity for the dimensions where the query and the points fall into the same bin. These quantizations are query-agnostic and there is potential to improve accuracy when a query-dependent quantization is used. In this work we propose a query dependent equi-depth (QED) on-the-fly quantization method to improve high-dimensional similarity searches. The quantization is done for each dimension at query time and localized scores are generated for the closest p fraction of the points while a constant penalty is applied for the rest of the points. QED not only improves the quality of the distance metric, but also improves query time performance by filtering out non relevant data. 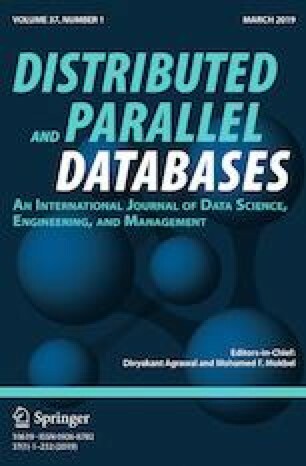 We propose a distributed indexing and query algorithm to efficiently compute QED. Our experimental results show improvements in classification accuracy as well as query performance up to one order of magnitude faster than Manhattan-based sequential scan NN queries over datasets with hundreds of dimensions. Furthermore, similarity searches with QED show linear or better scalability in relation to the number of dimensions, and the number of compute nodes. This work was partially supported by the NIH National Cancer Institute/Big Data to Knowledge (BD2K) Program under Grant R01CA214825 and joint NSF/NIH Initiative on Quantitative Approaches to Biomedical Big Data (QuBDD) (R01) Grant R01CA225190.